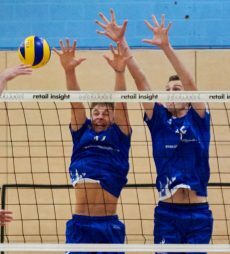 Both teams had very different line ups from the last match two weeks ago – Docklands fielded just three players from the last starting six whilst Malory only retained one, setter Adam Baiza. Malory have been severely affected by the Tier 4 visa fiasco and have been able to register new players. Kostadin Stoimenov added some much needed power to the Malory side whilst veterans Alex Bialokoz and Luca Pinter brought a wealth of experience. The visitors enjoyed the best of the first two sets and despite Richmond gaining a set point in the first set, Malory took a 2-0 lead. Young setter Josh Green was introduced for Richmond and he helped revitalise his side’s attack as Docklands ran out easy 25-11 third set winners. They maintained their momentum into set four and led throughout, finally taking it 25-22. For the second match in a row Richmond made a poor start to the fifth set and Malory took advantage to lead 8-5 at the change of ends. Malory held their lead to gain match points at 14-10. But Richmond were not giving up and managed to tie the score at 14-14. Malory managed to sideout and then a rotation error by Docklands gifted Malory the set and match. Coach Andy Hopper said afterwards, “It was my error at the end and a silly mistake has cost us the match. The guys fought hard for the chance and I’m sorry we couldn’t finish it off in the end. We did well to come back from 2-0 down and the young guys Josh and Noah led the way. We’ll all learn from the experience and move on to complete the season”. Richmond now have just two matches left, both against bottom of the table Newcastle Staffs.